In Novem­ber 2015 Doro­thea Ram­mes, a bio­lo­gy stu­dent at Rad­boud Uni­ver­si­ty in Nim­we­gen, Hol­land, star­ted a six-month internship at Klasmann-Deilmann. She is inves­ti­ga­ting the impact of water type on peat moss cul­ti­va­ti­on for her Master’s the­sis. Here we take a brief look at her back­ground and her typi­cal working day on this cur­rent pro­ject. Intern Doro­thea Ram­mes wears snow shoes at work and kne­els on planks five metres long. This ensu­res that she doesn’t sink into the ground at her work­place, a for­mer peat extrac­tion site cal­led Drenth. Hol­ding a bucket of peat moss in her hand, she spreads it over the site befo­re adding a lay­er of straw to pro­tect the vul­nera­ble moss from the ele­ments. At ano­t­her site, her col­leagues are using net­ting ins­tead. The team will sub­se­quent­ly ana­ly­se which alter­na­ti­ve works bet­ter. Com­ing from the Ems­land regi­on, the 24-year-old was of cour­se fami­li­ar with the name of Klasmann-Deilmann. Her first internship – with the Ger­man Asso­cia­ti­on for Natu­re Con­ser­va­ti­on (NABU) – heigh­te­ned her awa­reness still fur­ther. In her half-year at NABU, her focus was on pro­tec­ting grass­land in the flood­p­lains of the river Ems. When she visi­ted Klasmann-Deilmann with a NABU dele­ga­ti­on during this peri­od, she got to know the local sub­stra­te pro­du­cer bet­ter. A pre­sen­ta­ti­on by Jan Köb­bing of Klasmann-Deilmann’s Land Use divi­si­on ulti­mate­ly moti­va­ted the stu­dent to app­ly for an internship. Jan Köbbing’s talk had been about the Spha­gnum-far­ming pro­ject that he heads. It is the world’s lar­gest effort to cul­ti­va­te peat moss: by the end of 2016, 10 hec­ta­res of land form­er­ly used for peat extrac­tion will be ‘ino­cu­la­ted’ with moss. Klasmann-Deilmann wis­hes to use this to gene­ra­te a rene­wa­ble resour­ce for the pro­duc­tion of gro­wing media. This fasci­na­ted Doro­thea Ram­mes, who­se love for bio­lo­gy at school had led her to take a degree in this sub­ject, and who had beco­me espe­ci­al­ly inte­rested in natu­re con­ser­va­ti­on and rene­wa­ble resour­ces. In her day-to-day work, she assists Jan Köb­bing and his team not only in dis­tri­bu­ting and covering the peat moss: the stu­dent and her col­leagues are also crea­ting embank­ments along the dit­ches to opti­mi­se the flow of water to the moss sites. 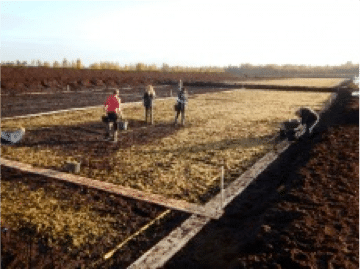 Addi­tio­nal­ly, in the green­house, they are gro­wing dif­fe­rent moss spe­ci­es on black peat and (for com­pa­ra­ti­ve pur­po­ses) on white peat, and are con­duc­ting expe­ri­ments. “For examp­le, we add dif­fe­rent blends of nut­ri­ents and test dif­fe­rent water types and addi­ti­ves,” exp­lains Doro­thea Ram­mes, who regu­lar­ly checks water levels on the sites in order to crea­te ide­al con­di­ti­ons for the moss. She enjoys the mix of field and office work and is equal­ly moti­va­ted in both envi­ron­ments. Back indoors, she feeds the com­pu­ter with all the infor­ma­ti­on obtai­ned and per­forms data ana­ly­sis. Doro­thea Ram­mes is keen to pro­du­ce an excel­lent Master’s the­sis and, above all, to help ensu­re the peat moss thri­ves and yields a good har­vest.